Winston Churchill was arguably the greatest Briton to ever live, and, as his mother was American, we might also consider him a great American. Churchill fought in the Boer War, in India, and in WWI. He is most well known, however, for leading Great Britain through WWII as Prime Minister. In addition to his military and political achievements, he also wrote A History of the English-Speaking Peoples and many other works of unparalleled excellence. 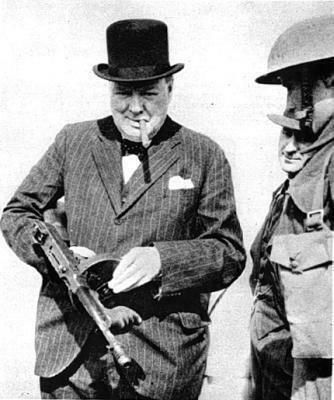 The Britons were well known for ignoring Churchill until they desperately needed him. He often bluntly told people what they did not want to hear. They ignored him until the truth of his assessments were unavoidable. Today, the dark veil of political correctness has descended over the once-free peoples of Great Britain and the United States. People are afraid to speak the truth due to both social and legal sanctions. Can you imagine a British or American politician of this day and age speaking with such honesty and such candor? You ask, "Can you imagine a British or American politician of this day and age speaking with such honesty and such candor?" I answer, unfortunately, no. The listlessness, pessimism, and emasculation of western civilization have created a culture lacking the will to even defend itself. Barring any objection, I'd like to add your article and link to my site.